Life will give you whatever experience is most helpful for the evolution of your consciousness. How do you know this is the experience you need? Because this is the experience you are having at the moment. Once upon a time, a woman and a man, newly met, decided to move away from the big city and back to the place where the woman had grown up. Her mother had offered her a job, but that wasn’t why she wanted to go; she already had a job. Really, it was just the right time. She told this man what she was going to do, and casually asked him if he might like to come too. He thought for one moment, maybe two, and said okay then; as long as we have a place near the beach and a dog of our own. They moved in May 2000. By December of that year, the man and the woman had a house by the sea and a tiny little black puppy. The man settled in quickly; sometimes she wondered if he was one of those people that are born in the wrong place. His father’s family were farming folk, so maybe that was it, who knows? She took a little longer to settle in – she missed her friends and was annoyed by the terrible coffee, bad food, poor service, and pubs filled with old men who stopped talking and stared when new people walked in. She grew to love it later, when she had children – but she had to drop a whole heap of baggage about her home town first. The time came, as it does, when the couple wanted to buy a house. It was too expensive on the coast, so they started looking around in the hinterland. The woman had grown up on a farm way up in the mountains – she didn’t really want to do that again. She had watched her parents work themselves to the bone on that farm, keeping up their day jobs and working the farm every spare minute. And it was 45 minutes to the nearest town. It made her nervous to be that far away from civilisation. The woman’s parents were still there, but not for long – her mother was agitating for change. Nevertheless, they found themselves looking at a little weatherboard cottage in the same valley, but closer to town, across the road from the primary school that the woman had attended when she was little; that little school held such warm memories for her. The woman remembered what she had said when she left her home town: never, I am never coming back! And then she remembered what her mother had always said: never say never. She laughed – she was old enough to appreciate irony, and nearly old enough to laugh at herself. The man and the woman looked at this property. It was one acre, and had two little houses on it. 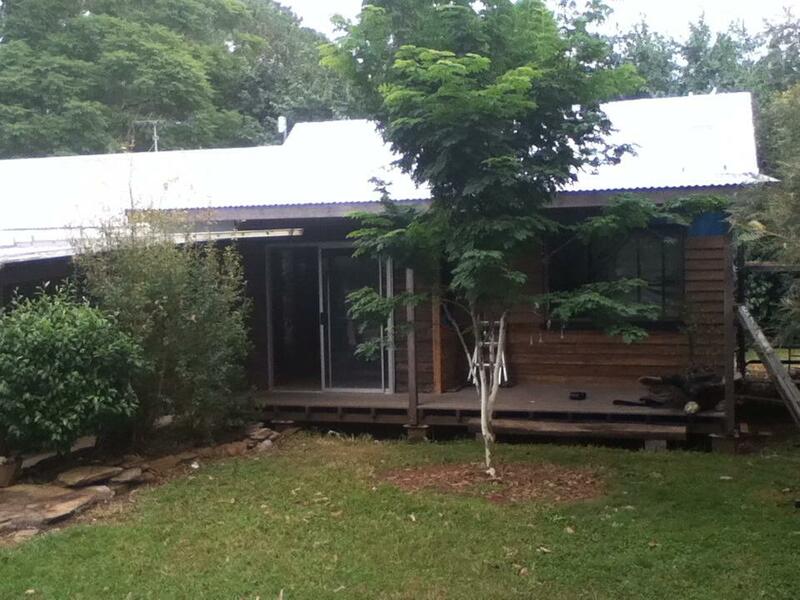 The main house was a 2 (maybe 3 at a stretch) bedroom weatherboard settlers cottage, recently renovated. It looked clean and tidy, and felt like a happy kind of place. The floor rippled in the kitchen from a dodgy re-piering job, and the ceiling was so low that the woman could touch it in some places, and it was tiny. But…it was on tar road, which the woman wanted, had a kerbside garbage service, a pipe to the river and a pump so they didn’t have to rely on rain water, and there was a second dwelling that had established tenants paying rent. There was rich soil, big, beautiful trees – and they could afford it. They made an offer, and in May 2003, they had their very own mortgage. In May 2004, they had their very first baby. They never seemed to have much money, but they did a few things to their house – they put awnings on the western side windows, put screen doors on to keep out the flies, and a glass sliding door on to the verandah. The man worked very hard in the garden, landscaping, digging vegetable gardens and growing ducks, one batch of ducklings after another. The woman still hadn’t really settled though, and was restless. The house was too small, too far away from town, all her friends lived too far away, she was sick of driving everywhere, she didn’t like her community. She had a job in a town one hour away and wanted to move there. She insisted they put the house on the market. The man was surprised, but thought he’d let her run with it to see how far it would go. The Universe was not so relaxed and sent a termite invasion. Everything got too hard, and the man persuaded the woman to take the house off the market. The woman was getting lessons in the futility of forcing change against the flow of things, as well as the necessity of staying with something until it was ready to be released (it wasn’t her first lesson of this type and it wasn’t going to be the last either). In defeat, she said Goddess, if I must stay here, send me friends and an opportunity to be part of a thriving community. The woman left her job, fell pregnant with her second baby and found a swimming hole down the road. When she closed the escape hatch (she always liked to keep the back door open in case of escape) and looked around, she found that this place was full of beautiful people that wanted to be her friends, and lots of opportunities to create a vibrant community. Or start it anyway. They didn’t have enough money to do the whole lot, but they could make a start. Lucky them, the woman’s old friend, a family friend from childhood and their children’s godfather was a master carpenter and he offered to build it for them. Plans were drawn up, put through council, a new electricity pole was put in, foundations were built, the wood was purchased. 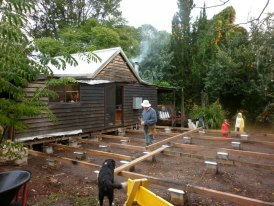 the building site – the verandah has been taken off, piers buried in the ground. The frame was built – and they ran out of money. Truth be told, they had run out of money before that, and if it wasn’t for the woman’s brother, they wouldn’t have been able to pay for all of the wood. Thank goodness for the kindness of friends and family. So, work stopped in December 2011. Money was so tight and work was so intermittent and hard-scrabble that they wondered if they would ever have the money to finish it. The frame was built – and stayed that way for the longest 16 months EVER. 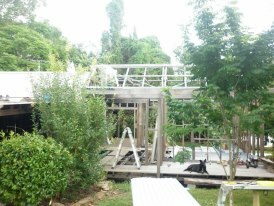 Roof is on, weatherboard cladding is on, doors and windows in, even a floor. Woo hoo! It’s not finished, no not yet. It needs gyprock on the walls and electricity inside the walls. But it can be used. In a couple of days the glass sliding door that separates the new house from the old will be taken out and put into its new spot, thus connecting the two halves and sealing the new house totally. Have faith said the woman to the man – her faith tends to be stronger. Stick with it said the man to the woman – his tenacity is always stronger. And it’s true – his faith is stronger now and she has learnt that sometimes you have to stay with something to the very end – that there is a deep satisfaction in that. Not that it is the end (is it ever?). Previous No, I can’t do that. Actually, maybe I can. Hey! I can do it! Next A year of writing. What a story..thank you for sharing your struggles and strengths! It shines a bright light of perspective into my own life. hey, thanks for reading! I guess that’s why I write – to make sense of it all, and in the hope that others can make use of my experiences too. Oh I love this… so much to learn in it, as always… patience being a big thing. Full-time mothering is teaching me that, when I’m burning inside to write more and get my book out there more… only 18 months before school starts, plenty of time and all… and look, you got your rooms built! Thank you! it was really good to sit down and write it out like a story – wonderfully therapeutic. i showed it to my husband – and he was enthralled (he isn’t always by what i write 😉 ). How do non-writers understand their lives i wonder? Beautiful story! I have been experiencing greater flow and greater faith over the past few years of concentrated effort toward personal healing. I love how the two of you have kept each other afloat. And it sounds like you’ve both grown because of it. Thank you 🙂 Sometimes we sink each other too omg 🙂 It was very helpful to lay it all out like that in a big picture way. Thank you Dale 🙂 Let me be honest – I don’t like most things I have published :). I read the little house story out to the group after I won the prize, and it was the longest 5 minutes or so of my life :). I thought, when is this going to end, it’s so long and dull and self absorbed! I barely refrained from offering to have the competition rejudged, or wondering if there was a failure of the judge herself!